I have too much to post before Christmas day haha. Today, both are from Pop Culture Cosmetics! First up, 'Silent Night' over Sinful Colors' 'Rain Storm'. 'Silent Night' is a dark blue crelly with all white/holo glitter: micro, medium squares and hexes, large circles, several large half moons, and large snowflakes & stars. 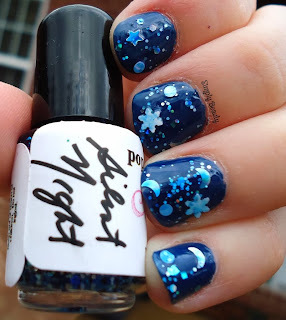 The glitter types really make it, in my opinion. I love it over 'Rain Storm', too. 'Holly Jolly' is a mint-green base filled with green & red glitter. 'Frosty', but with a green base. Either way, it's a cute Christmas polish! One note, though, it does get a little gloopy after a few uses. 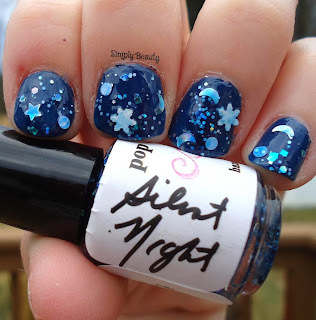 LOVE Silent Night, great base polish color. Perfect combination. Holly Jolly I'm on the fence about. Great swatches!